Welcome to our events page, we do our best to keep you updated here on what’s going on at ACAS. Some events are private as to maintain the confidentiality of our clients and are unlisted. Most of our events are geared towards serving the East and Southeast Asian communities, and some events are open to everyone. Feel free to contact our offices to find out more 416-963-4300. For the most up to date information please like and follow the ACAS Facebook page and check out the latest section for what’s been happening! at the ACAS office (260 Spadina Ave, Unit 410). For gay/bi Asian men, trans men & trans women. If you need a translator, please call before your visit to arrange one for you. 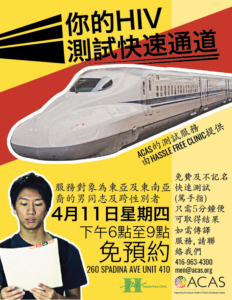 men@acas.org or 416 963 4300.